A sleepy Monday on a long weekend calls for an easy-to-assemble brunch. T and I found that in a one-dish mushroom bake. 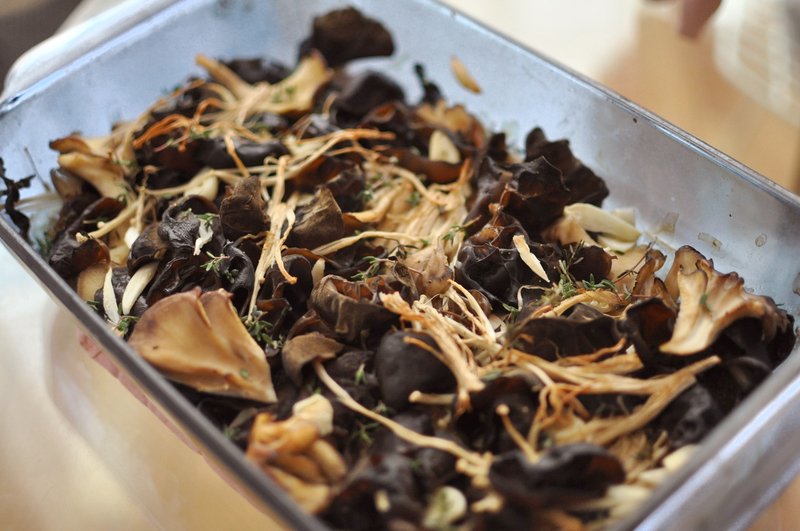 We were inspired by the roasted maitake skillet we enjoyed this Saturday at Brooklyn Sandwich Society. While our version was delicious, theirs sang from the addition of a duck egg, crème fraiche, and a side of lightly pickled jalapeños. We will be sure to add those to ours next time. Combine the mushrooms, garlic, butter, and pepper in a large roasting/baking pan, and stir to combine. Add the sprigs of thyme and roast in the oven until golden brown and all of the liquid has evaporated, 25 to 30 minutes. Remove from the oven and top with lemon zest, salt, and chopped thyme.